Chris came over today to help with trimming, mowing, trashing, disassembling, and a hell of a lot of other work in the front and back yards. It was literally a sweat shop around here, with Chris, Marilee, myself, and yes, even Taylor pitching in. As far as the photo above, I take particular care in cropping photos. I usually leave enough of a border to show an entire scene without losing too much information. 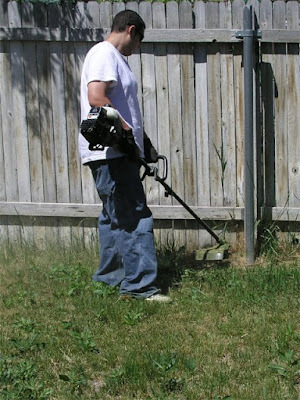 But this picture of Chris weed-whacking the back yard is cropped this way for a reason. It's literally the foreground that's key here. Like the homemaker who cleans the house before a maid comes over, we did yard work today before "The Sprinkler People" come out this week to install a working sprinkler system! No more broken sprinkler heads, no more cracked pipes, no more brown grass. It'll take two days to install the whole system, and I'll be taking as many pix as I can to document the transformation.